So, I finally got my internet back this morning, whippee! The past few days have been a little dull without it. However, I didn’t shrivel up and die or anything even close so now I know life will go on. 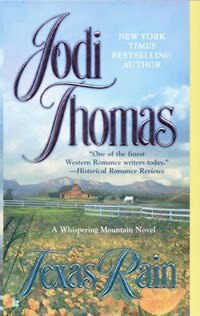 I caught up on some reading and have discovered a new love of western romances. My local library had on their “sale” shelves three books by Jodi Thomas with Texas in the titles. How could I possibly resist? I started with Texas Princess only to realize it is book two in a series of four. Since I didn’t have book one, Texas Rain, I went ahead and read the three I had and later searched for book one. It’s a wonderful series and any fan of historical romance would enjoy it. Other than reading I did a little writing too…very little. New characters and plots keep popping into my head when I know damn well I have more than enough works in progress as it is. What can I say? There’s just no arguing with some characters. I’ve finally begun the vampire story I keep threatening to write. And here is where the drama comes in: is now the best time for more vampires? Okay, not really drama, just doubt and confusion. I don’t particularyl want to spend time on vamps right now but they won’t leave me alone. I’m going to have to write them out to keep them quiet. Speaking of which, I have finally sent off ALL of the prizes. As of today every single package has been shipped. US winners please allow a couple of weeks, international I have no clue. If you won and don’t recieve a package from me within a reasonable time please email me.